In and of itself vertigo is not life-threatening, but – and this is a really big but – the dizziness of vertigo is a leading cause of falls, and “falls are the leading cause of fatal and non-fatal injuries for older Americans,” according to the National Council on Aging. Medical reference guide Merck Manuals adds that 30 percent to 40 percent of older Americans living on their own, and fully half of those living in nursing homes, will experience a fall each year. In 2015 Medicare put the cost of those falls at over $31 billion annually and that number continues to increase as the senior population grows. And then there’s the “quality of life” issue. 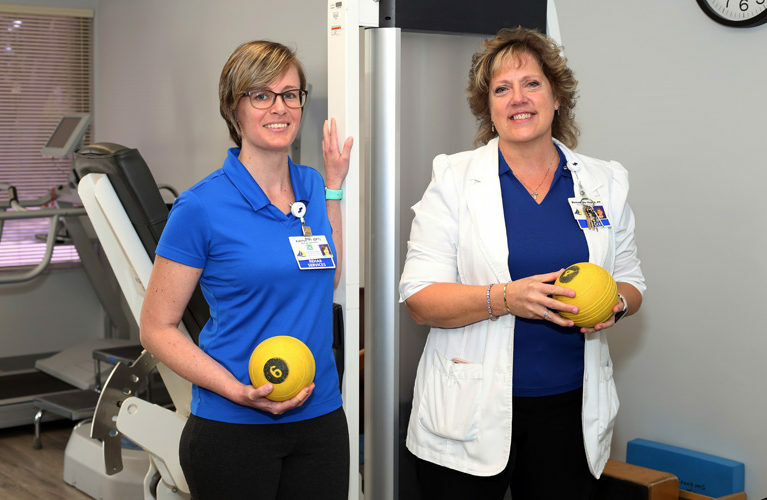 As Bernadette Haugh, director of rehabilitation services at Sebastian River Medical Center explains, “the biggest damage from a fall is not always something physical. When somebody falls, all of a sudden their whole life changes. Fortunately, according to both Haugh and physical therapist Kathryn Storey, help is available for those suffering from vertigo. Often that help takes as little as a single session of physical of therapy, and Haugh points out that Medicare and most insurance will cover that cost with a referral from a primary care physician or even an urgent care or walk-in clinic doctor. In dealing with vertigo, it’s important to know, as the University of Maryland Medical Center explains, that vertigo is actually more of a symptom than a condition. Conditions that can bring on this lightheaded dizziness include respiratory, neurological, cardiovascular and vision problems. Changes in medications can also trigger certain forms of vertigo, but the most common cause is an inner ear problem called “benign paroxysmal positional vertigo,” or BPPV. BPPV is caused by tiny crystals of calcium carbonate becoming lodged within the inner ear. Do not, however, even think about reaching for a Q-Tip. You cannot reach the semicircular canals where these crystals collect and could well cause irreparable damage by trying. What you can do is learn what is known as “the Epley maneuvers” for BPPV. Those calcium carbonate crystals mentioned above are normally found in your inner ear’s utricle. They detect motion and send that information to your brain. If, however, those crystals detach from the utricle and move into the semicircular canals, they send incorrect signals to your brain which, in turn, causes that spinning sensation we call vertigo. Johns Hopkins Medicine describes the Epley maneuvers as a series of turns and twists of the head and neck that dislodge those crystals from the semicircular canals and sends them back to the utricle where they belong. Both Storey and Haugh are confident the Epley maneuvers can and will help patients suffering from vertigo caused by BPPV. The physical therapists at SRMC are trained to assess your condition to see how severe your vertigo is, prescribe exercises that will reduce the severity of the problem – done with your physical therapist or at home – and keep an eye on your progress. If you’re experiencing episodes of vertigo, talk with your primary care physician. He or she may well recommend a qualified physical therapist to help solve the problem. The rehabilitation services at the Sebastian River Medical Center, a Steward Family Hospital, are now located at 8005 Bay Street, Suite II. The phone number is 772-582-2068.